Govt Lauches Online Software for Departmental Proceedings For Transparency with Accountability & Citizen centricity against corruption. Speaking on the occasion, Dr Jitendra Singh complemented the Department of Personnel and Training (DoPT), CVC and other departments for their collective efforts in this direction. He said that the Government under the leadership of Prime Minister Shri Narendra Modi has been working on the principles of ‘maximum governance, minimum government’, transparency with accountability & citizen centricity and zero tolerance against corruption. The Minister said that the aim of the software is to see that the proceedings are done against corrupt officers and the honest officers are not put to harm due to inordinate delays. He said that the bureaucracy is the tool of governance and the aim of the government is to provide work-friendly environment to the officers. 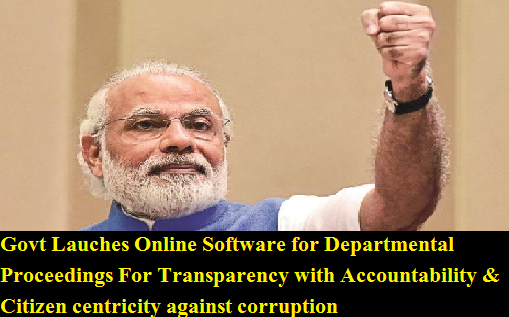 He said that the software will check that the honest officers are not intimidated and it will encourage the transparent functioning in the Government. It will ensure that the malpractices are not spared and the good practices are not punished, he added. He said that the efforts have been made to complete the disciplinary enquiry within 2 years. He said that reducing the timeline in completion of disciplinary proceedings will give faster relief to the honest officers. Online Software for Departmental Proceedings: The online software portal for Departmental Proceedings is as per provisions of All India Service (AIS )(D&A) Rules, 1969, against All India Service officers. Department of Personnel and Training (DoPT), CVC and other departments for their collective efforts in this direction.